Stepper motor is brushless DC motor, which can be rotated in small angles, these angles are called steps. Generally stepper motor use 200 steps to complete 360 degree rotation, means its rotate 1.8 degree per step. Stepper motor is used in many devices which needs precise rotational movement like robots, antennas, hard drives etc. We can rotate stepper motor to any particular angle by giving it proper instructions. Mainly two types of stepper motors are available, Unipolar and Bipolar. Unipolar is easier to operate, control and also easier to get. Here in this tutorial we are interfacing Stepper Motor with STM32F103C8 (Blue pill) board. 28BYJ-48 is a Unipolar Stepper motor which requires 5V supply. The motor has a 4 coil unipolar arrangement and each coil is rated for +5V hence it is relatively easy to control with any microcontrollers like Arduino ,Raspberry Pi also STM32.But we need a Motor Drive IC like ULN2003 to drive it, because stepper motors consume high current and it may damage microcontrollers. 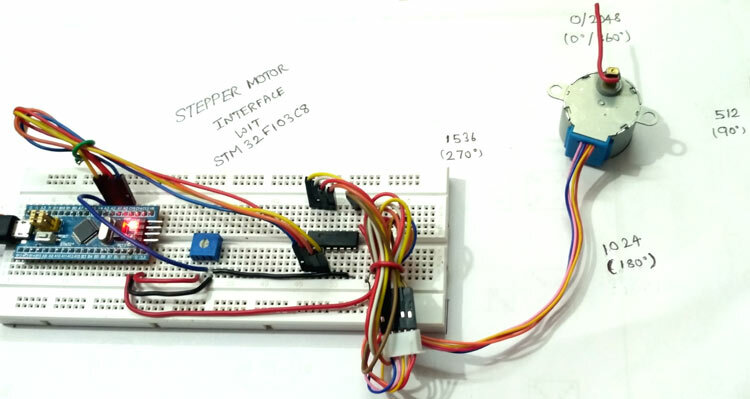 Stepper motor can also be controlled without any Microcontroller, see this Stepper Motor Driver Circuit. Pins (IN1 to IN7) are input pins and (OUT 1 to OUT 7) are corresponding output pins. COM is given Positive source voltage required for output devices. Further connections for stepper motor are given below in circuit diagram section. Below is the connections explanation for above circuit diagram. As we can see in the below diagram, the PWM pins are indicated in wave format (~), there are 15 such pins which can be used for pulse output to stepper motor. We need only four pin, we use (PA0 toPA3). Pins (PA0 to PA3) are considered as output pins that are connected with input pins (IN1-IN4) of the ULN2003 IC. The output pins (OUT1-OUT4) of ULN2003 IC are connected to the stepper motors pins (Orange, Yellow, Pink, and Blue). A potentiometer is used as to set speed of the stepper motor. Set the speed of stepper motor by varying potentiometer. Then manually enter steps for rotation either in clockwise (+values) or anticlockwise direction(-values) via SERIAL MONITER present in ARDUINO IDE (Tools->Serial monitor) or CTRL+SHIFT+M. According to the input value given in serial monitor certain steps of rotation takes place in stepper motor. Like the previous tutorial, we programmed the STM32F103C8 with Arduino IDE through USB port without using FTDI programmer. To learn about programming STM32 with Arduino IDE follow the link. We can proceed programming it like an Arduino. Complete code is given at the end of the project. First we have to include the stepper library files #include <Stepper.h> for using stepper functions. Then we define no. of steps to complete on rotation, here we use 32 because we are using Full-Step (4 Step-sequence) so (360/32 = 11.25 degree). So for one step, the shaft moves 11.25 degree that is stride angle. In 4 Step sequence, 4 steps are required for one complete rotation. We can also use Half step mode where there is 8 step sequence (360/64=5.625) stride angle. Then we have converted the analog value into digital by storing those values in variable of integer type, after that we have to map the ADC values for setting speed so we use the below statement. Learn more about using ADC with STM32 here. To set speed, we use stepper.setSpeed(result); We have speed range of (1-1023). We must create instance like below to set the pins that are connected to motor. Be careful in these steps as most of them do a mistake here in this pattern. They give wrong pattern and because of that coils cant be energised. Below statement is used to get the value of steps from serial monitor. For example we need 2048 values for one full rotation (32*64 = 2048) that is 64 will be the gear ratio and 32 will be half step sequence for one rotation. Below code is used to call the instance and run the motor .If rotate value is 1 it calls the function stepper one time and one move is done. int rotate = 0; //declare variable rotate with 0 for input rotation.